← Alfredo, Shells, Chicken, Broccoli and Cheese! I found this recipe in a Peter Reinhart book called Crust and Crumb…I think. Anyway, it’s pretty fantastic banana bread – I only wish that my baking soda hadn’t expired! Both loaves sunk in the middle and I was so bummed. I warned M that the loaves didn’t look pretty but they tasted good. The next time I have at least 3 good sized bananas languishing away on my counter top, I will be sure to make this bread again. I stupidly made this the afternoon after I sprained my ribs – you’d be surprised how often you move your rib cage around just doing subtle movements. Isn’t that the way it always is with an injury? It’s so easy to take your healthy, pain free body for granted until it’s not so healthy anymore. Thankfully the pain has subsided and I’m feeling a little more like myself everyday. The only thing I’m waiting on is this annoying cough! Anyway, this recipe says it makes two 8×4 loaves – it lied. I made two 9×5 loaves out of it. Thanks for reading, enjoy! *UPDATE: I made this again March 17th with the following (successful) modifications. Two sticks of butter is an awful lot, so I tried using 1 1/2 sticks of unsalted butter instead. My other mod was to use 10 ounces of brown sugar and only 5 ounces of white sugar. I know these aren’t major changes, but when modifying any baked item you want to try small changes first. Baking is a science! These loaves looked better than the original recipe usually turns out. The top didn’t sink as much either, which was a nice surprise. 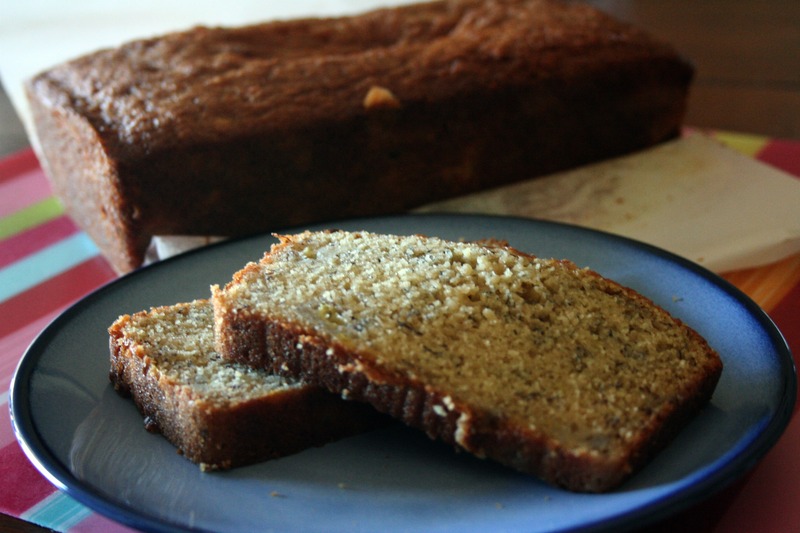 It tastes sweet enough to me, and even M didn’t notice an objectionable difference – it’s still his favorite banana bread:) Thanks for reading! 1. Sift flour, baking soda, baking powder and salt. 2. Using a standing mixer fitted with the paddle attachment or using a hand mixer, cream butter and brown sugar until light and fluffy – about 2 minutes. 3. Mix in eggs one at a time, incorporating each egg before adding the next. Mix in vanilla and continue beating for 2 to 3 minutes until light and fluffy. 4. Mix in 1/3 of the dry ingredients, then 1/3 of the buttermilk, then 1/3 of the mashed bananas. Continue in this manner until all the ingredients are incorporated and the batter is smooth. Stir in walnuts. 5. Preheat oven to 350 degrees and grease two 9×5 loaf pans. Fill the pans 2/3 full with batter. Bake for 45 minutes then reduce the oven temperature to 325 degrees. Bake for an additional 15 minutes or until baked through. The safest way of knowing if they are finished is to test them with a probe thermometer. The internal temperature should be 180 – 185 degrees. 6. Let the loaves cool in the pans for 10 minutes, then turn them out on a rack to cool for at least one hour before slicing.